Hubby and I enjoy fajitas and tacos. I’ve made chicken fajitas from scratch a few times and we always enjoy it. But I’ll fess up right now: if I only have ground beef, I use a mix every single time. Why? It’s quick and easy and I find that ground beef needs a lot of TLC when working with it — the mixes do the trick nicely. Chicken, you can marinade and infuse all kinds of flavour into it fairly easily, but ground beef always seems to need a lot of work. And tonight, I just didn’t have it in me to do all that work! Haha. However, I have friends who only put seasoned meat and cheese in their fajitas or tacos. I can’t do that. I need a variety of colour, textures, temperatures and tastes in that little bundle of goodness! Over a medium heat, brown the ground beef. Once cooked through, drain in a colander and set aside. In a wok, heat the oil on a medium heat. Once hot, add the peppers and onion. Sprinkle on a few dashes of seasoning salt and pepper to taste. Cook for a few minutes until onions are just starting to soften, but peppers still have a bit of crispness to them. Remove from heat and place in serving bowl. Over a medium heat, pour in the drained meat into a pan, the fajita mix and the water. Cook according to the instructions on the packet, but it will generally only need a few minutes, stirring to coat all the meat fully. Remove from heat and transfer to serving dish. Again, over medium heat, place a soft tortilla into a non-stick pan for a minute or so, just until the one side browns slightly. Then flip over and repeat for the other side. Remove and transfer to plate, repeating for all tortilla shells. Alternately, you can do these on an indoor grill for a minute if you prefer grill marks on yours, or you can warm them in the microwave, as the instructions on the package allow (or in the oven) for heating. Easy peasy. You can add other condiments if you like, such as diced tomatoes and chopped green onion, guacamole, hot sauce, etc. 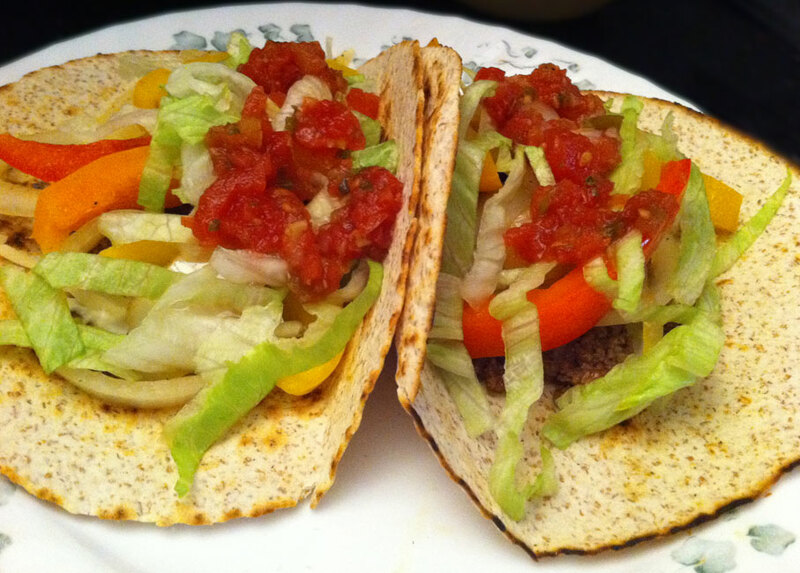 This entry was posted in dinner, Lunch, recipe, stove-top and tagged beef, cheese, flour tortilla, ground beef, lettuce, onion, peppers, salsa, sour cream. Bookmark the permalink.